Stock options have been part of compensation pay in Corporate America for nearly a century. While they remain a relatively common long-term incentive award, they no longer are the primary such award for executives at most U.S. public companies. Yet, options continue to be the most utilized compensation mechanisms at pre-IPO start-up companies where they are a means of sharing future growth of the company with most or even all employees without having to distribute cash. Despite their decreased utilization, stock options or their first cousin, stock appreciation rights (“SARs”) continue to be part of the incentive pay package at many public companies. The recently released 2015 pay rankings of 200 CEOs at U.S. public companies with at least $1 billion in annual revenue prepared by Equilar indicated that 57% of CEOs received an option award in 2015. The median value was approximately $4.5 million. Meanwhile, 55% of the companies for whose executives Ayco provides financial planning services currently grant stock options or SARs, although this is significantly less than the percentage that granted options nearly ten years ago, as illustrated below. Moreover, nearly 10% of our survey group has ceased granting stock options within the past two years. Options now also make up a smaller share of the total long-term incentive award at those companies which continue to issue them. They have been replaced primarily by performance shares, performance units and restricted stock units. We have been monitoring the design of stock option plans for over 20 years. The following is our updated informal survey of the design features of stock option awards currently in place at those companies still granting options. While employee stock options may have reached their greatest popularity in the 1990s, they were created in the early-to-mid 20th century as a means of giving managers a stake in family controlled businesses and an incentive to help grow the value of the company. As far as the tax treatment of options, the Revenue Act of 1950 added a provision that any gain realized on what were called “restricted stock options” would not be taxed upon exercise, but rather, only upon sale of the stock. These were the predecessor of what we now know as incentive stock options (“ISOs”). During the 1960s, the concept of nonqualified stock options, taxable as compensation at exercise, developed. By the late 1960s and through most of the 1970s and early 1980s, stock market growth slowed and restricted stock was perceived being less risky and more valuable than stock options as an equity- based award at many public companies. Then, in the late 1980s and through the 1990s, stock prices moved upward significantly. This also saw the development of the technology industry. Stock options now became the most popular long-term incentive award and not just for executives. In some cases they were offered to all employees. It is estimated that options constituted 75% of long-term equity awards by the end of the 20th century. The down-turn in the markets in 2000, the tech bubble, followed by accounting rule changes for stock options in 2006 and the financial crisis of 2007/08 led to a significant decline in the use of stock options in the first decade of the 21st century. A number of companies even allowed executives to exchange underwater options for a vastly smaller number of full-value shares. We also saw the growth of other performance-based equity and long-term awards, and the growing influence of proxy advisors like Institutional Shareholder Services (ISS) in executive-pay practices. So, while stock options remain a piece of the long-term incentive pie today, they are a decreasing slice. Historically, companies issued stock options with a term of ten years contingent on continued employment. That is, an active employee could exercise the option at any time after vesting until it expired. By the mid-1990s, we began to see a few companies extend the term of the option to 15 and even 20 years. (Only ISOs cannot have a term of more than ten years). As a result of accounting changes that occurred just over a decade ago, we started to see companies shorten the term of new grants. Among our survey group, just over 15% now grant options with a term of less than ten years. Of these, the shortest term is 5 years (3 companies), the longest is 8 years (3 companies), and the most common term is 7 years (18 companies). 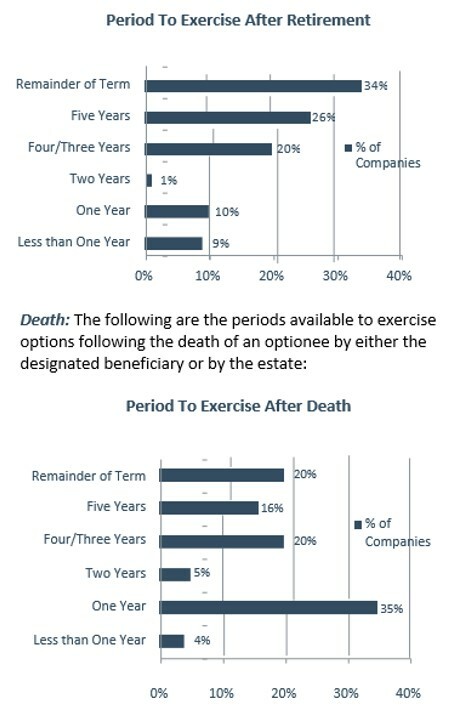 Interestingly, companies with shorter exercise periods do not generally change or reduce vesting periods. But, we have also seen a few companies return to a 10-year term for new grants. A vesting schedule determines when some or all options may first be exercised, which can act as a retention device. Most companies still impose only a time-based vesting schedule for their stock option and SAR grants. In most cases, options may not be exercised for at least one year from grant (90% of our group) while 1% starts vesting two years from grant and the remaining 9% begin vesting three years or more after grant. Less than 2% have a monthly vesting pattern. Performance Vesting - Performance vesting features are utilized more commonly with restricted stock and RSU awards than stock options. But we still do see a number of companies allow for acceleration in vesting if performance targets are achieved. Just over 7% of our survey group has a performance requirement to vest a portion of one or more grants made over the past five years. In some cases, only the CEO or the most senior executives have options with performance targets, or they are included in a special retention grant to a key performer. Typical targets include share price appreciation, total shareholder return, or when designated financial targets are achieved. Acceleration In Vesting - In the event of a retirement, death or disability, most plans provide either for an acceleration in vesting, a continuation in the normal vesting schedule, or give the committee administering the plan discretion to accelerate or continue vesting. We found that just over 10% of the survey group provide for a continuation in vesting and 35% provided for the acceleration of vesting in the event of retirement. This figure increases to over 55% in the event of an optionee's death. The overwhelming majority of plans provide for an acceleration in vesting in the event of a change in control (CIC). Many companies have recently reviewed their CIC practices and we are seeing more companies adopting a "double-trigger" requirement for the acceleration in vesting of options in this situation. Retirement: Termination due to retirement typically allows an optionholder a longer post-separation exercise period than termination for other reasons. A generation ago, when many companies maintained a pension plan, the definition of retirement usually was based on when an employee was eligible to leave and receive immediate pension benefits. Now, however, the definition of retirement eligibility needs to be specified in the stock option plan document or award agreements. The most common definition in the plans we reviewed is age 55 with 10 years of service; but over half of the companies in our sample survey group use a different definition. We counted 10 companies that provide a longer period to exercise options following normal retirement age than in the event of early retirement. Here are the periods to exercise that cannot extend beyond the normal expiration date of the option award. Voluntary/Involuntary Termination: In the event that an employee voluntarily terminates (without “good reason”) or is involuntarily terminated by the company without cause prior to eligibility for retirement, a slight majority of companies allow executives to exercise vested options for a limited period of time. Virtually all companies will immediately cancel options in the event that an employee is terminated for cause. Retention After Exercise: We are continuing to see more companies require senior executives to retain stock acquired as compensation (stock options, restricted stock, and performance awards payable in stock) for some period of time after acquisition. Currently, 40% of our survey group has such a retention requirement for options exercised by executives who have not met share ownership guidelines. Additionally, 5% of the survey group require senior executives to retain the shares for a defined period of time or until retirement (for data on share ownership guidelines and retention requirements, see the March 2016 Digest). Market stock units are an amalgam of stock options and RSUs that provide the potential for upside growth along with some protection in the event of stock price drop. They have been adopted by a small number of companies, although one company in our database granted them for several years and then eliminated them. Reload options have virtually disappeared for awards made after 2006, primarily due to accounting rule changes. In contrast, SARs have become much more popular. They can reduce the administrative cost of an option program, result in fewer shares issued, and encourage retention of stock after exercise. One company even allows eligible employees to exchange up to 100% of their annual bonus for SARs. A “net exercise” procedure can achieve similar results. Essentially, it allows an individual to exercise an option without tendering cash or shares to the company. The individual then receives the “net” shares, similar to a cashless exercise for stock, but without the expense and administrative hassle of utilizing a broker. We expect this exercise procedure to continue to draw interest. One design feature seen in the plans of a few foreign owned companies is a cap on the maximum gain permitted under an option grant. This might be 150% or 200% of the grant price. Another interesting feature we have seen in a small number of plans is an automatic exercise provision. It provides that all vested “in the money” options automatically will be exercised on the last trading day of the exercise period. This feature would address the inadvertent failure to exercise valuable options issue, as well as the problem inherent in a blackout of all stock transactions because of securities law restrictions. Income associated with the exercise of a NQ option by an employee (or former employee) is considered supplemental wages subject to the 25% federal flat withholding rate, unless total supplemental wages exceeds $1M, when it jumps to the highest federal rate, 39.6%. Under revised accounting rules effective next year, employers may allow employees to elect to have up to the maximum tax rate (federal, state, and FICA) withheld in shares. ISO Reporting - Companies must furnish an information statement to employees who exercise ISOs by January 31 of the year after exercise. This may be Form 3921 that the company must submit to the IRS by February 28 (paper filers) or by April 2 (e-filers). The company must report the ordinary income upon a disqualifying disposition of an ISO on Form W-2 as wages; however, neither tax withholding nor FICA taxation is required in this event. Basis Reporting - Under the current cost basis reporting rules which apply to equity awards granted or acquired after 2013, the basis to be reported on Form 1099-B when stock is sold should not include the “spread” or compensation element reported on Form W-2, but only the exercise cost. At sale, this amount, plus the compensation element reported on Form W-2, is to be reported on Form 8949 filed with the individual’s tax return to calculate any gain or loss on sale. State Tax Reporting - The state tax reporting and withholding requirements for stock option income can be confusing for employers with employees who travel to states other than their regular work location. The amounts subject to taxation and how this is determined can, and do, vary by state. Most employers still do not withhold nonresident state taxes in these situations and leave it to the employee and their tax preparer to calculate and pay taxes to any nonresident state. Foreign Stock Reporting - A stock option with respect to a foreign company’s stock is to be reported by a U.S. taxpayer in the year of grant on Form 8938 as a Specified Foreign Financial Asset. It generally would not be taxable until exercise. NQ options held by insiders at any time during a 12-month period before a U.S. company “inverts” into a foreign corporation are potentially subject to a 15% excise tax under new anti-inversion rules. SEC Form 4 Reporting - Section 16 insiders (executive officers and directors) are subject to reporting on a Form 4 the grant of an option or SAR, its exercise, and a sale of stock associated with the option. However, the grant and exercise are not considered a matchable purchase in almost all situations, so will not create a risk of a short-swing profit violation under SEC §16(b). Most public companies have written compliance policies for §16 insiders. These may recommend or require that insiders only exercise options or sell company stock during an open window. Stock options can be viewed as a true pay-for-performance vehicle, at least if the desired performance measure is stock price appreciation. However, the shareholder vote advisor, ISS, has indicated that it doesn’t consider stock options to be a performance-based form of pay. This has been part of the reason more companies have replaced stock options with other performance-based long term awards. (For data on the current mix of long-term incentive awards, see the May 2015 Digest). Unrealized stock option gains are part of the calculation of “realizable pay” which is now being used by more companies to calculate and compare executive pay practices. Their value also will be integrated into the CEO pay ratio calculation to be reported by most companies in next year’s proxy statements. Some have suggested that utilizing stock options can induce excessive risk-taking because there is no downside exposure. Thus, the greater the growth in share price the greater the reward. Offsetting this are share ownership requirements that typically do not count unexercised options, as well as stock retention requirements. Unlike RSUs, options are not subject to §409A so long as granted at fair market value and not subject to deferral of gains.